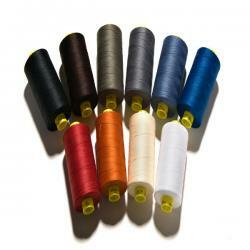 Quality 100% polyester Gutermann thread from Germany in bulk quantity. This size #70 thread is for use in gear projects, and other applications with high wear and heavy materials. Suits also for top stitching on shell clothing. Can be sewn with all sewing machines. Only 5 rolls left in stock, after the stock is empty this product is not available. Only 4 rolls left in stock, after the stock is empty this product is not available.